Is the System Broke or Broken? 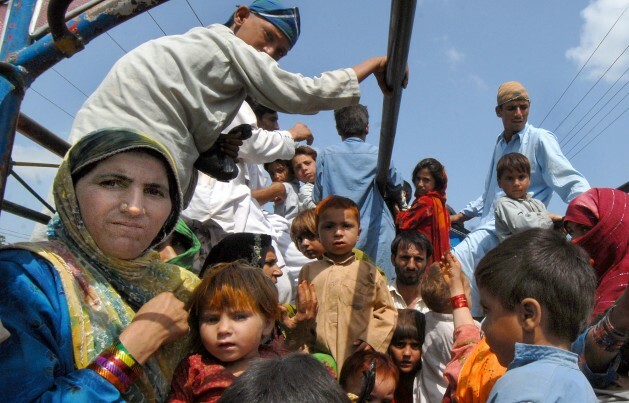 Families displaced from their homes in Pakistan’s troubled northern regions returning home. Credit: Ashfaq Yusufzai/IPS. UNITED NATIONS, May 4 2016 (IPS) - Though the upcoming World Humanitarian Summit may seem timely, a debate ensues on an important question: is the world humanitarian system broke or broken? The first-ever World Humanitarian Summit, which takes place in Istanbul on May 23-24, was convened by UN Secretary-General Ban Ki-moon to address the pressing needs of today’s humanitarian problems. “We believe this is a once in a generation opportunity to address the problems, the suffering of millions of people around the world,” said European Union Ambassador to the United Nations João Vale de Almeida during a press briefing. More than 125 million people are in need of humanitarian assistance globally. If this were a country, it would be the 11th largest in the world. Over 60 million are forcibly displaced, making it the worst humanitarian crisis since World War II. Crises now last longer, increasing the average length of displacement to 17 years from 9 years. However, need has surpassed capacity and resources. As of the beginning of May, almost $15 billion in appeals is unmet for crises around the world including in Nigeria, Central African Republic, and Syria. Approximately 90 percent of UN humanitarian appeals continue for more than three years. The meeting therefore represents not only a call for action, but also an alarm to reform the increasingly strained humanitarian system. From the recent earthquake in Ecuador to the Ebola crisis in West Africa, local communities and NGOs are often the first responders due to their proximity. Among the summit’s core responsibilities is strengthening partnerships and a multi-stakeholder process that puts affected civilians at the heart of humanitarian action. Senior Research Fellow at the Overseas Development Institute’s (ODI) Humanitarian Policy Group Christina Bennett agrees, noting that humanitarian and aid structures have changed very little since it was first conceived. “It’s still a very top-down, paternalistic way of going about things,” she told IPS. In an ODI report, Bennett found that the system has created an exclusive, centralised group of humanitarian donors and actors, excluding local non-governmental organisations (NGOs) from participating. In 2014, 83 percent of humanitarian funding came from donor governments in Europe and North America. Between 2010 and 2014, UN agencies and the largest international NGOs (INGOs) received 86% of all international humanitarian assistance. Meanwhile, less than two percent was directly provided to national and local NGOs. This has prevented swift and much needed assistance on the ground. Field Nurse for Doctor of the World’s Greece chapter Sarah Collis told IPS of her time working in the Idomeni refugee camp in Greece, noting the lack of medical resources and basic items such as food and blankets. “Distribution of blankets only happened at night because the aid agencies were worried about mass crowds,” she told IPS. “This meant that single mothers and young families often had no chance,” she added. Collis also recalled that there were only two ambulances for the whole region and at times, her team often had to pile six people in an ambulance at once. The most fast acting groups, Collis said, were the small NGOs and volunteers with direct funding sources and less red tape. From the recent earthquake in Ecuador to the Ebola crisis in West Africa, local communities and NGOs are often the first responders due to their proximity. They also have better access to hard-to-reach areas, have familiarity with the people and cultures, and can address and reduce risk before disaster strikes. On the other hand, larger organisations or institutions such as the UN often have difficulty conducting efficient and effective humanitarian operations. Médecins Sans Frontières (MSF) identified the UN as being at the “heart of the dysfunction” in the humanitarian system. They found that UNHCR’s three-pronged role, as being a coordinator, implementer and donor, led to their poor performance in South Sudan, Jordan, and the Democratic Republic of the Congo. In South Sudan’s Maban county, UNHCR was reportedly slow in response and struggled to mobilise qualified staff. Their “triple” role also made it difficult for subcontracting NGOs to share implementation challenges and for the agency itself to “admit to bigger problems or to ask for technical assistance from other UN agencies, for fear of losing out on funding or credibility.” This, in turn, impacted the quality of information to make sound decision-making. Though some funds from UN agencies and INGOs are provided to local NGOs, the relationship is more “transactional” rather than a “genuine, strategic engagement,” Bennett says. For instance, when aid is provided, it is often determined by the availability of goods and services rather than what people actually need or want on the ground. “We don’t have more of an alliance…with these organisations as equal players,” Bennett told IPS. These issues also came to a head during consultations for the World Humanitarian Summit in Geneva. Though many acknowledge that there is an important role for INGOs and donor governments in the humanitarian system, there is an emerging understanding that such actors must shift their positions from one that is dominating to one that is enabling. Organisations such as Oxfam and Adesso have called for the UN and large INGOs to enable local NGOs by directly providing funds. This will not only help them to prepare and improve their responses to crises, but it would also put decision making and power “where it should be,” Oxfam stated. They have also urged for a target of 20 percent of all humanitarian funding to go directly to local organisations. Already, a charter has been created to commit INGOs to these actions. Among the signatories are Oxfam, Care International and Islamic Relief Worldwide. Despite these calls to action, Bennett told IPS that she does not believe that the World Humanitarian Summit will lead to change. “I think it isn’t something on the agenda of the World Humanitarian Summit…partially because they are hard to address and they’re very political—these aren’t easy wins,” she said. In order to achieve fundamental changes, donor governments and institutions with decision making power must address the underlying assumptions and power dynamics that hold the system back, Bennett remarked.